Gorgeous and delicious pinwheel cookies made from vanilla and chocolate-coffee flavored butter cookie dough. Here is an easy dessrt recipe for Mocha Pinwheel Cookies. Cream butter using an electric mixer until smooth, about 2 minutes. Mix in sugar and beat for an additional 2 minutes. Add in egg and vanilla and mix until well combined. Sift in flour, salt, and baking soda and mix with the creamed until just combined. Take 2 cups from the dough and set aside. Add in cooled coffee and cocoa powder to remaining dough. Mix in melted chocolate until well combined. 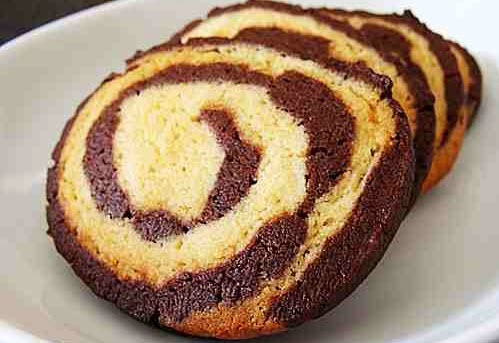 Divide both dough into three equal pieces, so as to have 3 chocolate and 3 vanilla.